Portugal, Transport - planes, trains and automobiles, Travel - bon voyage! It’s not just tourists who are taking to their Segways, however. Last November, Monsieur and I spied a pair of policemen using Segways to get around the Portuguese capital. Stood a good foot taller than anyone else on the street, they stopped at a newsstand, answered the public’s questions, before zooming off at a reasonable pace to the next stop on their beat. I just wondered what would happen, should they take chase to a bag-snatcher, so I visited the Segway site to see if these vehicles are fast enough to catch a thief. The Segway site tells us that the standard setting is 12.5 miles or 20 kilometers per hour. As they put it, this is “roughly equal to a 5-minute mile, a really fast run.” So I guess a Segway-riding policeman has a reasonable chance at catching the perp. As they’re a green alternative to other modes of inner-city transport, being charged by electrical sockets, the energy of which causes “fourteen times less greenhouse gas emissions than driving a car,” and as they don’t take up as much space as cars or scooters, the people at Segway must be hoping that interest in their product will steadily increase. A single charge will see you travelling a full 38 kilometers and 15 minutes of charge will allow you to go 1.6km. But if you weigh more than 117kilos, you can forget it. Segways can only carry so much of a person. And if you’re a lightweight at less than 45 kilos, the Segway won’t work effectively so this is an off-limits vehicle for kids and small people. I admit I’m curious to try one out at some point, but I doubt it will be on an organised Segway tour of, say, Florence. But first I’ll have to make sure my weight doesn’t double and I up my lingo. FYI, an outing on a Segway is called a GLIDE. Sounds a bit odd, no? “I’m just going for a glide.” or “how about you glide on over for coffee?” Hmmm. Not convinced. So before I sign glide off, have you ever been on a Segway? If so, please do tell. I’m keen to hear whether or not they have fans (apart from the Portuguese police) and why. Did you know there’s even such a thing as Segway Rally Races? Oh yes, people, it’s true. God bless Google; you learn something every day. Here’s the link to Razzbuffnik’s Segway post. 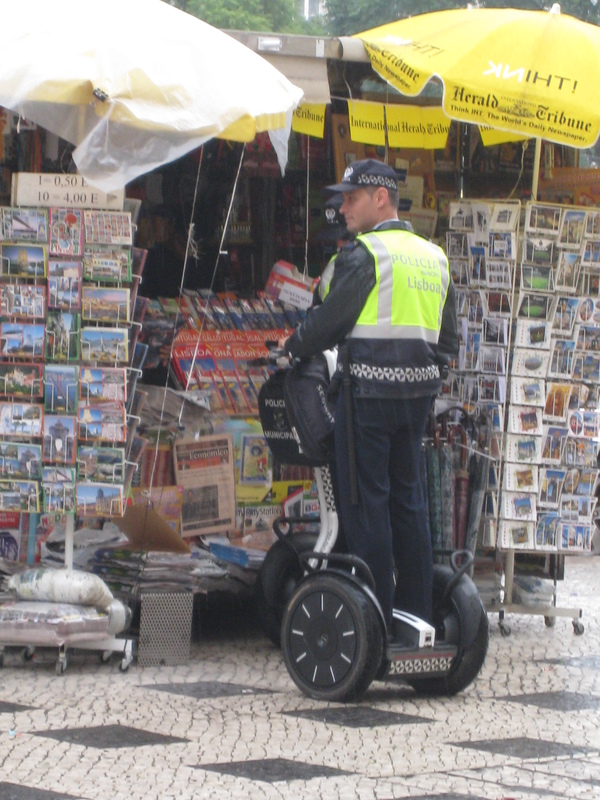 Since the policemen are so tall on their Segways, they look much more intimidating… in a sorta silly way. In the Short North Art District in Columbus Ohio USA there is a Segway store! I was so surprised to see it. Especially since I’ve never seen anybody actually ON one! Segways! I tried one in Langkawi Island in Malaysia, they have a ‘Go Green’ scheme that promotes them. It’s much more fun and less than dorky than it looks (although I wasn’t a fan of the elbow pads…) and we took them ‘off road’, where my bf got stuck in the sand as it couldn’t quite hold his weight! Uh! I used a Segway in Denmark at a Science park (Danfoss univers). It was included with the tickets and you got to go round a track. I enjoyed it – as in it is good to say I have done it! Not sure I would substitute walking/cycling for it though! 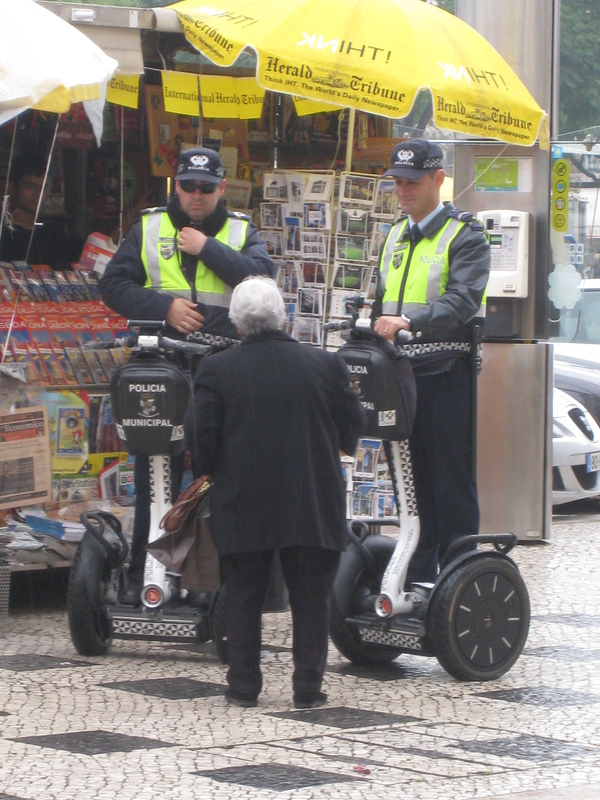 I know what you mean about Segways making the policemen bigger – just look at that poor little old lady craning her head up at them in the last picture. But seriously? I think it makes them lose credibility somehow. I mean, what would happen to them if they chased a purse-snatcher down a long set of stairs, like at Montmartre, or the Spanish Steps in Rome? Ker-plunk is what I imagine. Police hats all over the shop. But ooh, you’ve seen a Segway store? Cool. You should’ve gone in and asked for a test drive, I mean test glide. Hi Ann, well, you’re the first Epic visitor to have actually GLIDED on a Segway. Congratulations! I must say I’m curious to give it a go at some point but that’s about all. More interested in Danfoss Univers. That sounds like great fun – and the perfect environment for Jetson-mobiles like the Segway. Ha! I’d like to see the cops chase a crook on a segawy in Lisbon. I’d love to what would happen when they come arcoss the stairs that are all over that city. 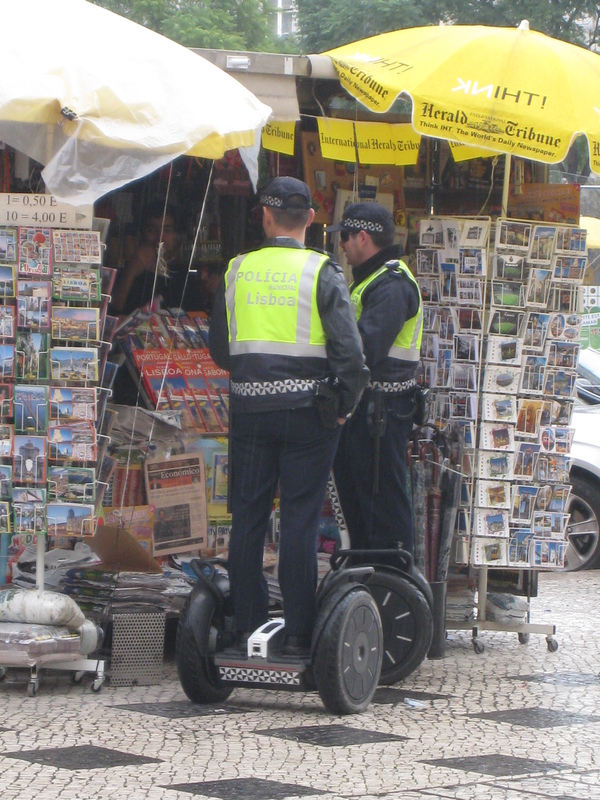 It can’t be very good for the police as I reckon they’d get pretty unfit fairly quickly if they used segways all the time. Squidink – another veteran Segway rider! Or is that glider? Where abouts did you go on the Segway on Langkawi? I’ve been to the island and just can’t imagine – especially as some of the roads are pretty bumpy! Razz – my sentiments exactly. What on earth are they thinking in Lisbon? It’s way too hilly to be practical. I watched a You Tube clip of a guy taking a Segway up the steepest street in the world – Baldwin Street in Dunedin (NZ for anyone who doesn’t know) and sure enough it got there so it would certainly be possible to chase a criminal up a Lisbon street but he’d have time to stop for a cuppa before you reached the top and caught him.